Open commissions for charity - traditional and digital artwork - Furtopia | Family Friendly Furry Forum and IRC Chat! Since the holiday time will be upon us next month, I decided to open up commissions starting next Monday, 10th November 2014 until the new year, with all of the proceeds going towards charity. So, instead of leaving here a large wall of text, I shall split the questions into little bricks of text, in which to resolve any misunderstandings or questions as briefly as possible. You can find the price on point 3, and the charity on point 6. My contact can be found on point 11. 1. What kind of commissions are we talking about? I am doing Digital drawing commissions, in a cell shading or soft shading style. While I am aiming more towards single characters, it may be more than that if need be, to be discussed about for every individual case. As far as characters go, anything from full body to just head busts or badges are available. 2. What style and quality may I expect? You can check my FA page HERE and my forum topic HERE to look at my previous works. I may deviate a bit from that if need be, but that’s a good reference of what I can do. 3. How much do they sell for? The drawings will be split into lineart and fully shaded. Lineart will go for $5 and shaded for $10 minimum, which you can find explained HERE . Any extra character will be ½ increment on the price. However, if you would like to give a little more I won’t stop you, all of the money (if any) I make will be given out by years end. I shall try and keep my quality consistent, however, if someone donates more than minimum, I may be persuaded to give a little extra effort as thanks. 4. What will you draw? I will draw most things (see 5. ), but since I only have any experience in beasts, animals and furries, anything that strays too much from that path may be of a sub-quality than that presented on 2. However, I’ll strive to do my best in any of the cases. 5. What won’t you draw? I won’t draw anything of a sexual or mature nature. I won’t draw any extreme fetishes. If you’re not sure do not hesitate to contact me with your query. 6. Where is the money going? 7. Why that small organization and not something larger? I have seen how said organizations work most of the time, and given the sheer scale of things my contribution will probably go unnoticed, that is assuming it will get anywhere at all by the end of the logistics. Acting in a small scale I know that it will at least make a difference for a couple of animals. A case I am aware of that happened near me was the following. My sister’s neighbour had this large black dog, they boasted her on facebook and such with their other pets, but as soon as she turned up pregnant they just dumped her, how do I know this? On my way from work one day I found her by the side walk, now, it’s a 15 minute car trip from where I saw her to her owner’s house, and she was walking on that direction, obviously tired. I saw her again the following day on my way to work, until my sister tried getting her, but she couldn’t. The woman was able to get her to her house and feed her and give her water since she was clearly dehydrated. My sister contacted her since she knew who the “owner” was and when confronted, she (the owner) stated that she didn’t want her there anymore, and would relinquish any ownership. So after the dog gave birth, she spayed her and found her a new owner, as well as one for each of the cubs. As a person who must give away dogs from my mutts all the time, I know how hard it is to find owners for puppies, so this woman already has lots of connections and gets the job done, which is something I respect a lot, hence why I am choosing her to donate the money to. I’ll only take payment trough PayPall. I’ll request it once you are happy with the piece, and once I get it I shall give out the full resolution picture. I may also do a public or private livestream if you wish, but I will only be available for that on the weekend, but it’s there if anyone would like. 9. What can I do with the picture? After you pay for it, the picture will be yours to do as you wish. Post it, show it, print it, gift it, as long as you don’t claim that you did it, it’s all good. 9.1. What will you do with the picture? 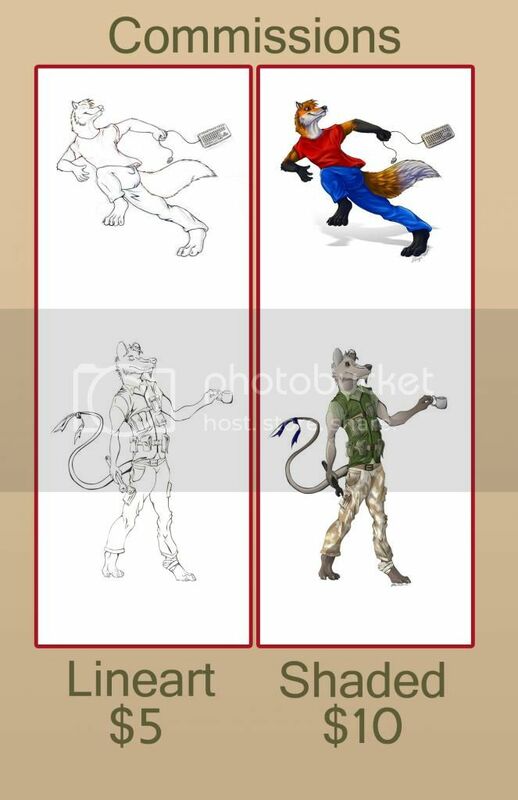 With your permission, I shall post it on my FA page, forum topic and other places I post the things I draw, with due reference to the commissioner, and watermark. 10. How many will you do? I’ll try and work hard to get as many as I can. This is mostly an incentive for me to work more on my drawings so I’ll try my hardest. However, I won’t have more than 3 active at any time in order to not get over my head, keeping optimistic here. 11. How may I contact you? You may send me an email at mister.miser.m@gmail.com, or mister.miser@outlook.com with your request, or any questions I failed to clarify above.